Abby the Librarian: AudioSynced: September Roundup! Y'all might know that I moved to a new apartment in April and I now live 7 minutes from my library. I never miss my commute... until it's time to work on the monthly AudioSynced roundup. Truth be told, it's really hard for me to carve out any time to listen to audiobooks anymore and I miss them! So you enjoy these audiobook reviews, and if you have any tips on how to make time for audiobooks, I would enjoy it if you'd leave them in the comments! Allison found time for downloadable audiobooks when an injury kept her off her feet for awhile (maybe I need to injure myself?). And Sarah finds time while she's creating delicacies in her kitchen (maybe listening to audiobooks would actually make me WANT to cook? ); check out her review of Beat the Band below. 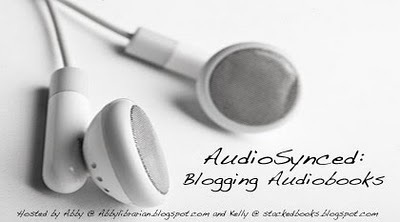 AudioSynced is a monthly roundup of audiobook reviews and posts from around the blogsophere, hosted by Kelly of STACKED and myself. Do you have a September review or post that I missed? Please leave me a link in comments and I'll update this post to include it. Don't have an audiobook review this month? Worry not; AudioSynced will be back next month at STACKED. And, of course, don't forget to check out Audiobook Jukebox for an extensive audiobook review database. The Council of Mirrors (Sisters Grimm #8) by Michael Buckley, read by L.J. Ganser, reviewed by Lisa at Shelf-employed. Lisa says, "Overall, a satisfying listen." Dead End in Norvelt, written and read by Jack Gantos, reviewed by Abby at Abby the Librarian (that's me!). I say, "Jack Gantos narrates, which fits the story perfectly since it's such a personal story. The reading is a little weird and quirky, but if you've ever heard Gantos speak, you know that's just how he is." On the Wings of Heroes by Richard Peck, read by Lincoln Hoppe, reviewed by April at Good Books and Good Wine. April says, "While I enjoyed On The Wings Of Heroes and the themes of family and the American home front of World War II, I did not fall head over heels in love with it..."
Satchel Paige by Lesa Cline-Ransom, read by Dion Graham, reviewed by Lisa at Shelf-employed. Lisa says, "Lesa Cline-Ransome writes in a folksy manner, and Dion Graham's relaxed Southern voice is a perfect complement, enhanced with sound effects and music." The Seeing Stone by Kevin Crossley-Howard, read by Michael Maloney, reviewed by Lee at Reading with my ears. Lee says, "This book isn't immediately captivating, but it does reward the patient listener." Ashes by Ilsa J. Bick, read by Katherine Kellgren, reviewed by Catie at The Readventurer. Catie says, "The best part of this book for me was that it was narrated by Katherine Kellgren." Beat the Band by Don Calame, read by Nick Podehl, reviewed by Sarah at YA Love. Sarah (who is cooking and listening - SMART! I wish I liked to cook...) says, "...[J]ust as I expected, it is fantastic!" Carnival of Souls by Melissa Marr, read by James Marsters, reviewed by Heidi at Bunbury in the Stacks. Heidi says, "...Marsters voiced the characters of Carnival of Souls excellently, and I certainly recommend this format." Cleopatra's Moon by Vicky Alvear Schecter, read by Kirsten Potter, reviewed by Heidi at Bunbury in the Stacks. Heidi says, "This was the third Sync title I’ve listened to this summer, but the first to truly impress upon me the certainty that I could not have enjoyed this book more had I read the text instead of listened." Swim the Fly by Don Calame, read by Nick Podehl, reviewed by Sarah at YA Love. Sarah says, "Do you enjoy laughing out loud? (I’m going to assume your answer is yes.) Then you need to read Swim the Fly by Don Calame, or even better, listen to the audiobook." Gone Girl by Gillian Flynn, read by Julia Whelan and Kirby Heyborne, reviewed by April at Good Books and Good Wine. April says, "I cannot imagine two better people to narrate Amy and Nick. Their voicing was just spot on, and also, pleasing to my ears, like I legit never set this audiobook aside." Major Pettigrew's Last Stand by Helen Simonson, read by Peter Altschuler, reviewed by Melissa at Book Nut. Melissa says, "...I adored it because Peter Altschuler is a brilliant narrator. All the right voices, all the right inflection... all the right emphasis in the right places, so I got the humor and I understood the conflict and I loved (absolutely adored) the Major."